What differentiates us from the younger generation—besides not smoking our house plants? I say it’s turkey soup—knowing how to make it, eat it and value it enough to rescue the carcass from a hostess’ intent to throw it in the garbage. To cooks of a certain age, turkey bits and bones are poultry gold. The day after Thanksgiving, I drove home with my daughter’s turkey carcass in the back seat. Turkey soup is chicken soup with muscle and worth every minute it takes to make, which is actually about ten minutes to start and another five at the end to strain it and get it ready for the refrigerator. The cooktop does the rest, simmering the infant soup into adult shape in about two hours. But let me begin at the beginning, which is after Thanksgiving when most of the meat has been harvested to make white bread sandwiches with lots of mayonnaise. The actual soup recipe is so simple it should not be called a recipe…maybe just heirloom instructions for getting the most out of a bird. Our grannies did this after Thanksgiving the way our grandchildren get up now at 3 AM to wade into Black Friday shopping—both post-turkey day traditions. Fill the pot with water to cover the bird. Put on high heat until it just boils. Turn down immediately to just a simmer. (You need to make sure it doesn’t boil over.) Let it stew for 2 hours bubbling away slowly. Then turn it off. Let cool. Add salt and pepper to taste. Strain the cooled soup into a large bowl. Throw the remains away. Refrigerate the soup. You can eat this soup warmed up as just a plain broth or instead, boil various pastas in the broth—tortellini swimming in warm broth with sprinkles of cheese on top are good. Adding bits of veggies ups the nutrition, which is why I keep grated carrots and frozen spinach leaves on hand. Or you can make a turkey vegetable soup—adding turkey bits and veggies of choice and maybe a handful of couscous to rev up the bulk. Turkey broth can be frozen, but I never have enough left to freeze. And that’s how to get the most from your turkey. Now, if I could only figure out how to squeeze the most out of each day, boil the time down to one delicious essence. How to get a little more: After pouring soup out, let bones cool. When cool enough to handle, one can strip more meat off the bones, easily done at this point, which can be added to the soup. A Chinese variation is to make the soup leaving out the “aromatics”, and adding two cups of short/medium grain rice. After boiling, cook on low heat stirring occasionally to prevent the rice from sticking on the bottom. 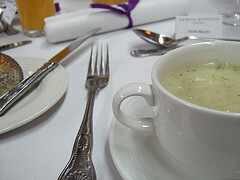 Cook until soup thickens to the consistency of porridge; garnish with minced scallions and celery(optional). From one geezer to another: Turkey soup has always been one of my families traditions. 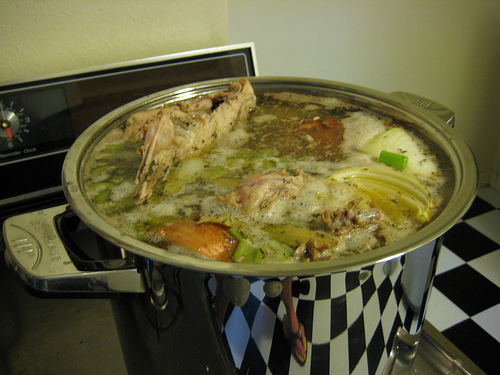 However, I usually boil the carcass first which makes it simpler to sort out the bones and bits of meat when drained. Then I put in veggies (onions, carrots & celery), seasonings, and rice and cook until all is tender. So Good!